The discounters are experimenting with economy brands. Pictured is German Norma's entry-price line 'my smile' for sausages. Aldi Süd is trialling a similar label called 'täglich gut', 'daily good'. Aldi Süd is trialling an umbrella brand for entry-price food products in Germany. According to Lebensmittel Zeitung, in four of its 31 regional divisions, the discounter has rebranded an initial test range of 15 products positioned at the lowest price level to the “täglich gut” (‘daily good’) label, giving up on the respective category brands. Aldi Süd says that in doing so, it is offering its customers a simple and clear structure and, above all, “good orientation” for products “serving the basic everyday needs”, with a focus on price. Aldi Süd is currently reassessing its architecture of 90 private labels with help from advertising agency Scholz & Friends. Experience from Aldi Süd’s international markets such as the UK (with its ‘Everyday Essentials’ range) and the US have been incorporated in the move, Aldi said. This also applies to observations made at its German competitors. You can no longer afford to leave the office for more than two or three days, otherwise you miss the next principle that Aldi is throwing overboard. This very morning it was the launch of the first rebate promotion with Nivea products, accompanied by Henkel’s Beauty Weeks which started last week at Aldi Süd in Germany. A move that severely undermines Aldi’s EDLP policy (although the promotion is mostly driven by Beiersdorf, it avoids any tangency with the shelf price and can be excused by Aldi as a quantity discount). Now, it is the re-positioning of essential parts of its core product offer. So far, Aldi in Germany largely had a one-tier architecture for its standard assortment, reflecting the aspiration that every product is good enough however low the price. Now, it is trying to separate the ‘better’ stuff from the ‘cheap’ stuff. This is another step away from its discount philosophy. But this doesn’t mean that it isn’t a sensible move. Quite successfully (although we don’t know details), Rewe Group’s discounter Penny was the first to go this hybrid way, combining an umbrella brand with a category-specific private label range. On a side note, generally speaking, Penny has been spearheading in a lot of features (instore bakeries, instore radio, shelving, ...) that are now being discussed under the buzz word ‘supermarketisation’ – discounters evolving to supermarkets. 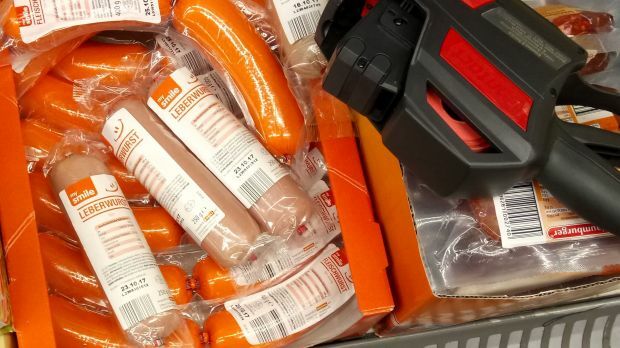 Similar moves have come from others, including Lidl’s Dulano (formerly Gebirgsjäger, ‘mountain trooper’) charcuterie range, the cheapest products of which display a rather harsh red packaging; or Norma, which is trialling a cheap label named ‘my smile’. The reasons are surely manifold. First, the thrifty shopper gets help on what to buy if he wants to buy the cheapest (that’s Aldi’s official explanation). But secondly, the more affluent shopper gets the even clearer sign that he or she may want to avoid this cheap item if he or she is interested in anything more sophisticated. In other words: “daily good” yells “buy-me-not!” That is one traditional function of the bare and plain design of a supermarket’s economy range – Rewe’s ja!, for instance. It is not a traditional discounter’s approach though. But once Aldi’s shoppers have up-traded, why let them trade down again? In this regard, there is also a certain marginalisation of a ‘cheap’ shopper. Was it the democratisation effect that made the discounters so popular and powerful, creating a class-less society instore – the old ‘champagne effect’ –, now it’s time to separate the classes again. Supplier and retailer may love it, but the nimbus of the discounters as the Robin Hood for food shoppers is vanishing fast – the price they pay for trading up. Of course, one can see this in a less ideological way. This is due to the simple fact that overall food quality has improved over time; and a tiered offer reflects the differentiation in aspirations and demands. Lastly, the increasing media attention primarily from TV programmes focusing on ‘product tests’ (the cheapest prime time programme you can produce while building the reputation of the consumer police) requires twofold: on the one hand, a clear differentiation by product quality when it comes to product tests; on the other hand, a clear lowest-price offer to withstand price comparisons. In the past, Aldi sometimes came off badly with price comparisons, simply because the retailer refrained from offering the lowest quality level (Robusta instead of Arabica coffee, for instance; or plain salt instead of iodised, fluoridated salt). In the meantime, this has changed. Except for the salt. Interestingly, the test is being carried out in two geographic areas – one near the company’s headquarters in the very north-west of the Aldi Süd empire; the other in the utter south-east. The first partly includes financially challenged households; the latter contains the ‘richest’ Aldi region, which has long had the highest sales per store. It would be very interesting to see how people in these two areas behave differently. Let's return to the beginning: strictly speaking, the principle Aldi Süd is giving up is not the private label architecture. It is the fact that, by downgrading core products, it no longer stands fully behind them; and that it is setting apart different 'classes' in a hitherto 'class-less' shopping environment.